Dental laser technology has been offered in our practice for over 15 years. When Dr. Tsang was first made aware of the benefits of laser treatment, he acquired the technology and training immediately. Dr. Elena Petrov is among a select group of dentists who were sent to Germany to be certified to train other dentists using the sophisticated Kavo Key3 Erbium:YAG laser. Lasers offer a gentle and effective way to disinfect teeth and gums and jawbone, often without the need for local anesthetic injections. Another benefit is the laser light energy penetrates deep into tissues to promote circulation and healing. 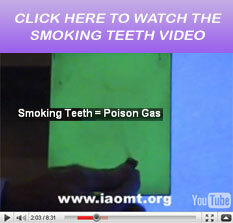 For cleaning out cavities in teeth, this can be an appointment without the dental drill. There is little to no pain afterwards and healing time is dramatically shortened. 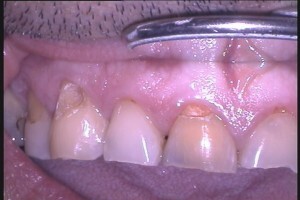 The decay in these two teeth were treated with an Erbium:YAG dental laser with no injections. 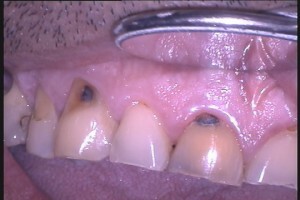 The patient felt absolutely no pain during the treatment or afterwards. 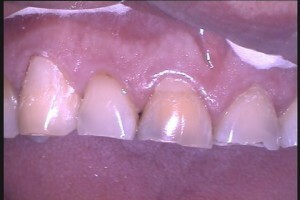 This treatment was completed in under half an hour. At Dentistry in Aurora, we take a holistic approach to dental treatment, primarily caring for our patient’s health and safety from both a conventional as well as “alternative healthcare” point of view. 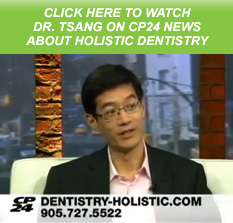 Dr. Chris Tsang and his team of dental professionals aspire to serve each patient with holistic (teeth, gums, jaws, bite, muscle and joints), preventative, predictable, long term and quality dental care – which will help them keep their teeth looking and feeling good for lifetime. We are proud to serve Aurora and Toronto area families for their dental care needs.